Typical of Francois Boucher’s love of nature and romance, Gallantries portrays two noblemen giving several noblewomen fishing lessons on a warm summer afternoon. One of Madam Pompadour’s favorite artists, Boucher was a leader of the Rococo Art movement in the 1700s. 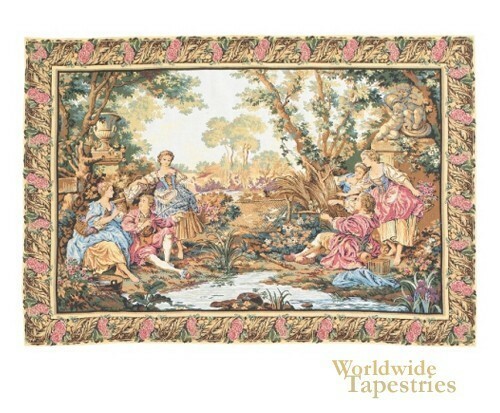 As director of the royal workshops under King Louis XV, he was responsible for the design of more than 400 tapestries. Gallantries is one of his lesser known works, but one of his finest. The artistry is evident throughout, from the romantic overtones of the scenes to the exquisite use of color to bring the scenery to life. One can almost hear the babbling of the brook. Gallantries is lined on the back and comes with a tunnel for ease of hanging. Dimensions: W 38" x H 26"
Dimensions: W 55" x H 38"